Ride the train to get to the Bikaner Junction. You can also take a plane to Jodhpur, then take the train from there. There are buses to and from Delhi and other major points in Rajasthan with destinations to Bikaner. The most interesting activity for visitors to Bikaner is to get down to the Camel Research Farm and drink some camel milk. Other places in India offer camel safaris. It will be a unique experience to see how milk is extracted from a camel. Once you’ve got around with the camels, there are other things to do in Bikaner. There are forts, sanctuaries and temples to check out too. It is a tremendous experience to visit either the wildlife or cenotaphs, the springing deer or imposing forts. For sumptuous meals & shopping, visit the Bhujia Bazaar. Taste the alu bhujiya, a potato dish with a Rajastani spice. There are many sweet shops selling specialty and North Indian desserts. Some sweets in Bikaner are made with camel milk. Amazing, isn't it? Bikaner is a good place to shop for carpets. Some are made with local wool. Even products made of camel hide can be found here. Bikaner itself is a little off the beaten track. Certainly the flavor is different to Jodhpur or Jaipur, where touts and tourists throng in equal numbers. Wander the streets, try the foods, and talk with the locals. This is one of those cities where every turn left or right could be a new adventure. 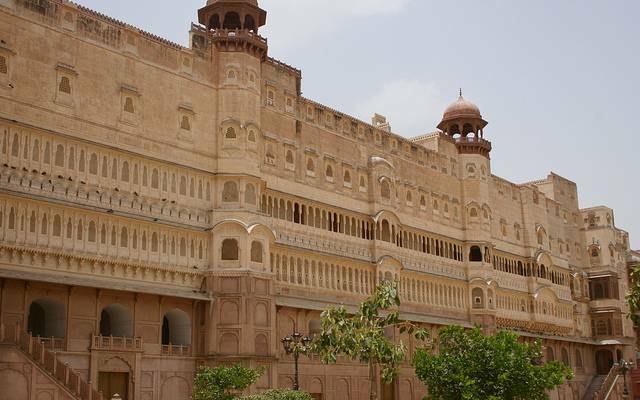 Although Bikaner is not on a hill, it is on a slightly raised ground and surrounded by protective walls. Visitors to Bikaner should be careful of snatchers and pickpockets. Carry along a little cash and always protect your passport. Women are advised not to go out alone at night.